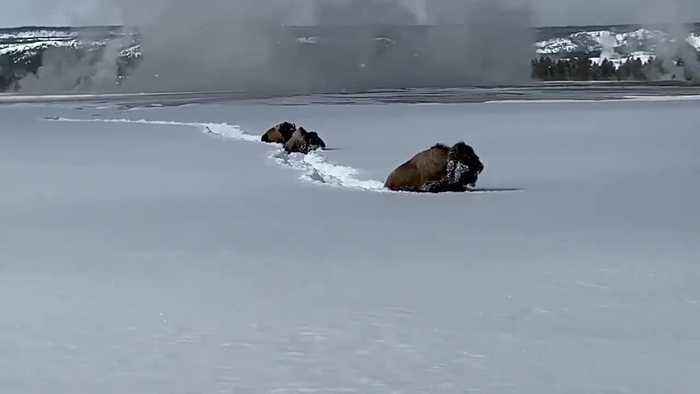 Occurred on March 10, 2019 / Yellowstone National Park, Wyoming, USA Info from Licensor: "I am a tour guide in Yellowstone and was leading a group of snowmobilers to Old Faithful. As we drove through Fountain Paint Pots, we had two bull bison just off the side of the road and could see a couple of cow bison with a young one going to make their way over to meet up with them. I wanted to film them as they made their way through the deep snow so my tour and the public could see what they deal with in winter."